Strategic Management of Diversity in the Workplace discusses the strategic management of ethnic and cultural diversity by taking particular examples from Australia, Canada, The United Kingdom and the United States of America, in order to determine the salient benefits that organisations could derive when ethnic and cultural differences are seen as opportunities, not as problems, and are viewed as benefits rather than threats. Strategic Management of Diversity in the Workplace provides a clear demonstration of the benefits, conflicts and challenges faced by organisations. The renewed interest in multiculturalism in academic and policy circles revives the debate about issues related to the management of ethnic diversity in society at large and in specific settings, such as corporate Australia. This book specifically focuses on this problematic area by aiming to explore the practice of management and application of multiculturalism in the workplace. This book seeks to examine post-multiculturalism in Australia and explore whether it has affected the ways in which corporate Australia deals with issues of diversity and the lessons learned here are ones that apply across the business world. 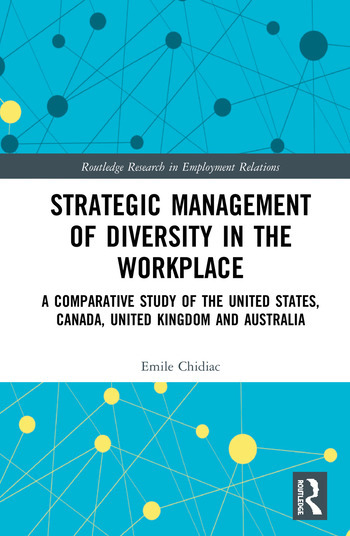 Strategic Management of Diversity in the Workplace would be of interest for researchers, academics, undergraduate and postgraduate business degrees students in the fields of Strategic Human Resources Management, Cross-Cultural Management, Managing Workplace Training and Managing and Leading People. Emile Chidiac is Adjunct Associate Professor at Edith Cowan University in Western Australia. His research focuses on strengths and weaknesses of organisations, immigration, diversity, diversity management, multiculturalism, citizenship and Australian Constitutional Law. He is currently doing his PhD in Law at Macquarie University.